What makes it special? Ideally located along the slopes of Jackson Hole Mountain Resort, the Presidential Suite offers the height of alpine luxury through a combination of stunning interiors-contemporary western wood, leather and stone accented decor, world renowned original artwork on the walls (including Joan Miro, Grant Wood, Giacometti)-and dazzling views of The famed Teton Mountains, best enjoyed from the suite’s expansive furnished terrace or many balconies. 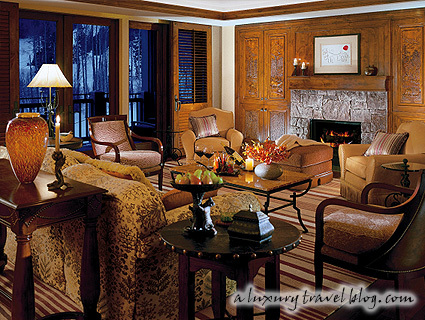 Located on the Resort’s eighth floor, the prestigious Presidential Suite provides a stylish setting for living, working and gracious entertaining with panoramic views of Rendezvous Mountain and the adjacent ski hill. This beautifully appointed suite may be enjoyed as a one-, two- or three-bedroom unit. The Presidential Suite features include: a spacious living area with gas fireplace adjacent to a full dining room that seats up to eight guests, a butler’s pantry with separate access when catering services are required, and a den that allows for a private office or reading room. In addition, a large terrace leads off the living area, and private balconies lead off each bedroom. Additional amenities include a stereo system, three direct dial dual-line telephones, high-speed Internet access, an in-room safe, a refrigerator with optional private bar menu, a built-in work area and oversized closet. The also suite offers one full master bathroom with each bedroom that includes dual vanities, separate deep soaking tub, glass-enclosed shower and separate WC with telephone; a guest powder room is located off the living area.